Music Emporium were from Los Angeles, California. Group leader Bill ‘Casey’ Cosby was a talented accordion player with a classical and jazz background who had won a number of national music competitions, including a Frank Sinatra-sponsored event at UCLA in 1967, and had recorded a couple of Accordion Masterworks albums under the name William Cosby. By the late 60s, he was also experimenting with popular music, playing keyboards in Gentle Thursday with fellow UCLA students, then changing the name of the outfit to Cage in 1968 and recruiting Dora Wahl on drums and Carolyn Lee on bass, both studying music at Long Beach State. 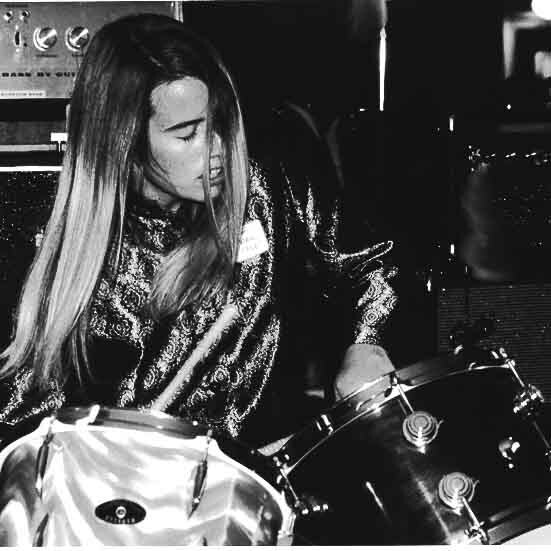 Cage soon morphed into Music Emporium and the final piece of the jigsaw was provided by Dave Padwin on guitar – the rest of the band having met him at the Guitar Center on Santa Monica Boulevard where he worked. The group were influenced by The Doors and Iron Butterfly, though the male and female vocals also bring to mind the likes of Sapphire Thinkers, Growing Concern, and The Peanut Butter Conspiracy. The band’s single was released on Sentinel in November 1968 and comprised of two songs from their forthcoming album. The title alone of the a-side is enough to conjure up the heady spirit of the times, the 60s counter-culture having a great interest in Eastern mysticism of course. ‘Nam Myo Ho Renge Kyo’ is a Japanese Buddhist Chant meaning roughly “I devote myself to the Mystical Law of the Lotus Flower Sutra”. Cosby’s keyboards are prominent from the start and are quickly joined by stinging fuzz guitar and pounding drumming that drives along this urgent psychedelic stormer. The lyrics are suitably cryptic and male and female vocals combine superbly on the otherworldly chanting chorus. I particularly like the way the song is constructed so that each chorus is preceded by a brief but blistering guitar break and the whole thing ends in joyously rambunctious fashion. Flip ‘Times Like This’ begins ominously but soon settles down into an up-tempo and jaunty pop psych number with an angular rhythm and a catchy Country-influenced chorus. Music Emporium’s album was produced by Bill Lazarus, an engineer that Cosby knew at Sunset Sound in Hollywood. This was meant to be a demo to sell on to a label which would then pay for the group to re-record it. In the event, Jack Ames of Sentinel Records decided to simply use the existing versions of the songs with re-recorded vocals. The album was released in a lavish die-cut gatefold sleeve a few month’s after the single in a very limited run of 300 copies and today is a mega-rarity easily selling for four figure sums. The LP is a bona fide psychedelic gem, so it is fortunate that Sundazed have reissued it from the master-tapes. Reissues: Both sides are on the self-titled album. You can also find the a-side on Sixties Archives Volume 8 and Love, Peace & Poetry: American Psychedelic Music. This entry was posted in Classic Singles and tagged Los Angeles, Music Emporium, Nam Myo Ho Renge Kyo, Psychedelic music, Sentinel, Times Like This. Bookmark the permalink.